Private pesticide applicators in the state of Georgia have to meet certain competency requirements in order to legally apply pesticides. They must be able to show that they understand pest problems and that they are willing and able to heed all legal responsibilities for proper pesticide usage. There are also laws in place regarding pesticide storage. Georgia pesticide regulations are in place to prevent pesticides from entering drinking water, as well as other water sources such as streams and rivers, where it might harm the local wildlife. Georgia pesticide storage practices should promote safety and prevent leakage and spills from escaping your farm. This means your pesticides shouldn’t even seep into the ground, as this could cause pesticides from entering groundwater, a source of drinking water for many. Keeping your pesticide storage area downslope from a well is a good way to minimize the amount of pesticides that may enter your drinking water. Still, proper pesticide storage will keep as little pesticide from entering the ground as possible. For proper pesticide storage, pesticides should be completely segregated from other materials. This means it should be stored separately from feed, seed, fertilizers, harvest, and anything edible to prevent contamination. It should also be organized so that different forms of pesticides are stored separately, minimizing the risk of contamination and reducing the probability that a pesticide will be improperly used. Your pesticides should always be stored in the original containers, with legible labels. An illegible label compromises your legal right to use the pesticide according to Georgia pesticide regulations. Secondary containment is essential when storing pesticides, and should not have a drain. 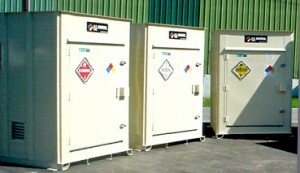 Secondary containment is designed to prevent your pesticides from escaping your pesticide storage facility. Allowing leaks and spills to escape into the earth is irresponsible and could endanger your family and neighbors. According to Georgia pesticide regulations and safety guidelines, your pesticide storage facility should be locked, restricting access only to authorized personnel. It should also be well-marked with warning signs alerting visitors of the presence of pesticides and fire hazards. All sources of ignition should be removed from your storage area, and your facility should be constructed to reduce the risk of fires. Keep an inventory of your pesticides and always use the oldest containers first, provided that they are within their shelf life. Report all qualified materials to the proper authorities, such as the fire department, when stored above specified amounts. If stored on shelves, store dry pesticides above liquids to prevent contamination in the event of a leak. Your electrical equipment should be explosion-proof to reduce explosion hazards. Your storage facility should be equipped with fire suppression equipment, alarm systems, and personal safety accessories. Remember to follow all Georgia pesticide regulations for higher safety. Note: While this document may cover a number of important compliant pesticide storage solutions, it cannot address every single situation for keeping pesticide storage maintained and compliant. Refer to Georgia pesticide regulations and federal documents for total coverage of regulations.